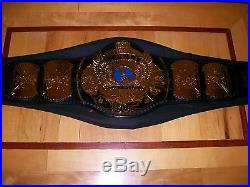 WWF WINGED EAGLE CHAMPIONSHIP TITLE BELT. ADULT CASTED 4MM THICK PLATES. FACTORY DIRECT : NEAR MINT TO MINT CONDITION! 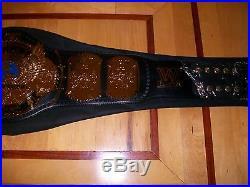 BELT IS IN MINT CONDITION WITH WITH NO FLAWS! THIS BELT MEASURES OVER FOUR FEET LONG AND WEIGHS WELL OVER 6 POUNDS. IT IS A TRUE BEAUTY. AN EXACT SCALE REPLICA WITH BRAND NEW ADULT CASTED 4MM METAL PLATES, MAKING THIS THE MOST ACCURATE REPLICA CHAMPIONSHIP TITLE EVER MADE! "Crafted after the actual belt handmade by Reggie Parks, the WWE Winged Eagle Championship Adult Size Casted Replica Belt is an exact-scale replica of the classic 1990's version with the Legends "W logo that measures 4 feet 2 inches long and weighs 6 pounds. The strap is made of our new and improved simulated leather, and the center medallion measures 9 inches high. PLEASE NOTE LAST PHOTO FOR LEGENDS "W" LOGO. 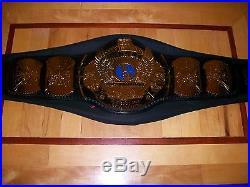 NOTE: THESE BELTS ARE FACTORY DIRECT AND ARE IN NEAR MINT TO MINT CONDITION. ALL ARE WRAPPED IN PLASTIC AND COME IN ORIGINAL CARRYING OFFICIAL CARRYING CASE. YOU WILL GET A BELT IN NEAR MINT CONDITION DIRECT FROM FACTORY! CHECK OUR FEEDBACK IF ANY DOUBTS! 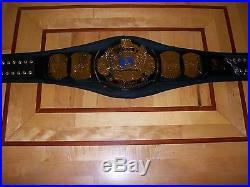 PHOTO'S DO NOT DO THIS CHAMPIONSHIP TITLE ANY JUSTICE! 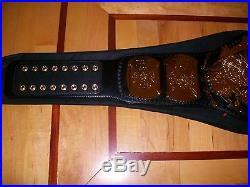 THIS BELT WAS THEE BELT IN THE 1990'S AND DURING THE ATTITUDE ERA. THE GOLD STANDARD OF ALL CHAMPIONSHIP TITLES. MOST FAMOUS TITLE BELT OF ALL TIME : THE WINGED EAGLE! HELD BY SO MANY LEGENDARY ATHLETES! COMES WITH ORIGINAL CARRYING CASE. MUST HAVE FOR A TRUE COLLECTOR. NEAR MINT TO MINT CONDITION! SPECTACULAR ITEM FOR AUTOGRAPHS OR TO BE DISPLAYED ANYWHERE! PICTURES DO NOT DO THIS ITEM JUSTICE! BRIGHT WHITE FLASH WILL NOT BE ON YOUR ITEM. ANY QUESTIONS FEEL FREE TO ASK (PLEASE NO NEGATIVE COMMENTS/ KINDLY ASKING TO NOT WASTE YOUR TIME OR OURS). If you have any questions feel free to ask. Please take a look at other items listed as you will see everything is authentic, original and 150% real. We cannot guarantee that any of our items are GUARANTEED to pass OR fail any third party authenticator. We are not here to burn anyone. All items come from a high end private collection. We cannot predict the outcome of any authentication as they are professional opinions not fact, but opinions. Check our feedback if any doubts. All items listed are 100% authentic, AND 99% of items are listed with picture proof or exact proof in auctions from public and private signings for authenticity purposes ONLY. ITEM WILL BE SENT FULLY INSURED PACKAGED PROFESSIONALLY WITH THE HIGHEST CARE. EVERYTHING IS 150% REAL AND ALL CUSTOMERS ARE FULLY SATISFIED. WE HAVE PERFECT 100% FEEDBACK AND WOULD LIKE TO KEEP IT THAT WAY. EVERY ITEM WE SELL IS ALWAYS AUTHENTIC. PLEASE TAKE A LOOK AT OUR OTHER ITEMS. CHECK OUR FEEDBACK IF ANY DOUBT ON AUTHENTICITY/SATISFACTION! The item "WWF/WWE WINGED EAGLE CHAMPIONSHIP TITLE BELT 4MM ADULT CASTED PLATES MINT" is in sale since Thursday, May 14, 2015. This item is in the category "Sports Mem, Cards & Fan Shop\Autographs-Original\Wrestling\Other Autographed Wrestling".ink" and is located in New York, New York. This item can be shipped to United States, to Canada, to United Kingdom, DK, RO, SK, BG, CZ, FI, HU, LV, LT, MT, EE, to Australia, GR, PT, CY, SI, to Japan, to China, SE, KR, ID, to Taiwan, ZA, TH, to Belgium, to France, to Hong Kong, to Ireland, to Netherlands, PL, to Spain, to Italy, to Germany, to Austria, RU, IL, to Mexico, to New Zealand, SG, to Switzerland, NO, SA, AE, QA, KW, BH, HR, MY, TR, BR, CL, CO, CR, PA, TT, GT, HN, JM.